Here is where we keep our new series of infographics that is designed to inform and guide business and individuals working in the IT and technology scene. 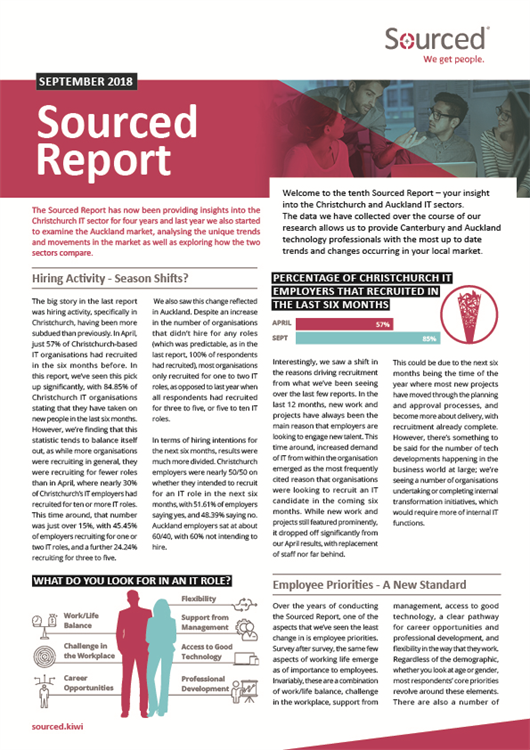 Released every 6 months, the Sourced Report will highlight the changes in the industry as the year progresses, ensuring that those involved in the local scene are up to date with the moods and attitudes of all contributors, employees, employers and jobseekers alike. If you would like to contribute to these results, please click through to let us know. The report can be seen below, but also downloaded as a PDF using the link at the bottom of the page. Welcome to the eleventh Sourced Report – your insight into the Christchurch and Auckland IT sector. The data we have collected over the course of our research allows us to provide Canterbury and Auckland technology professionals with the most up to date trends and changes occurring in your local market. Welcome to the tenth Sourced Report – your insight into the Christchurch and Auckland IT sector. The data we have collected over the course of our research allows us to provide Canterbury and Auckland technology professionals with the most up to date trends and changes occurring in your local market. 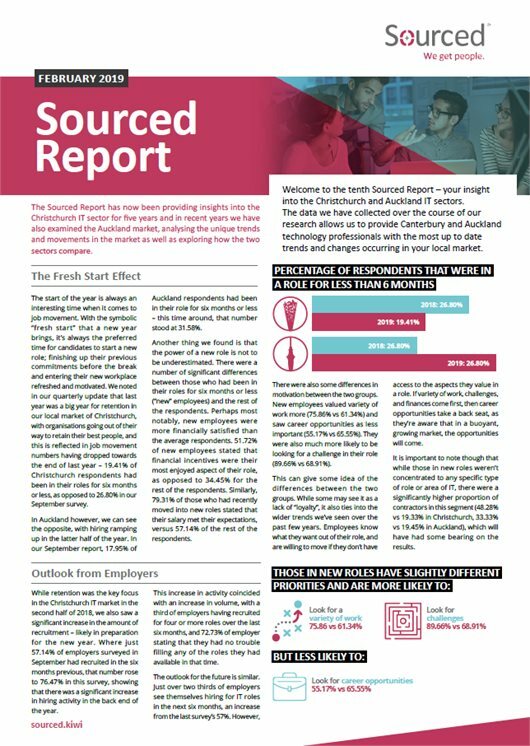 Welcome to the ninth Sourced Report – your insight into the Christchurch and Auckland IT sector. The data we have collected over the course of our research allows us to provide Canterbury and Auckland technology professionals with the most up to date trends and changes occurring in your local market. Welcome to the eighth Sourced Report – your insight into the Christchurch and Auckland, IT sector. The data we have collected over the course of our research allows us to provide Canterbury and Auckland technology professionals with the most up to date trends and changes occurring in your local market. 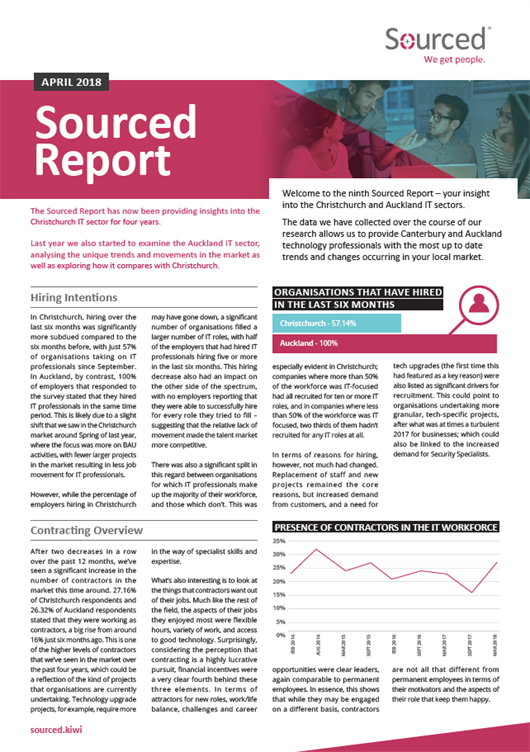 Welcome to the sixth Sourced Report – your insight into the Christchurch IT sector. 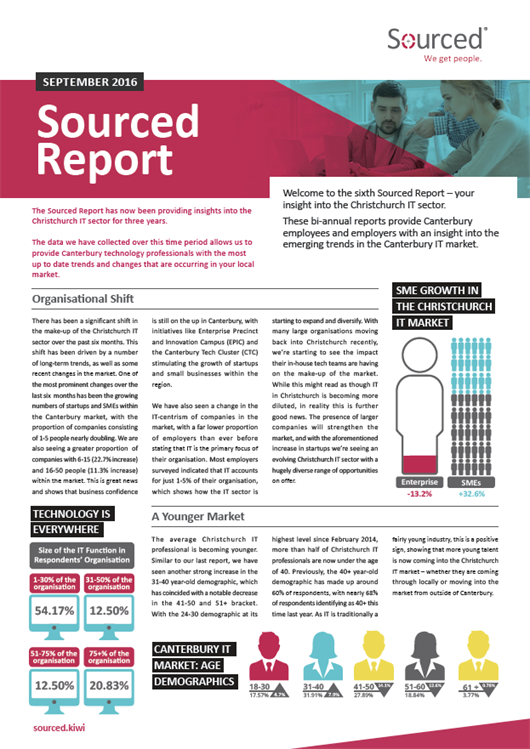 These bi-annual reports provide Canterbury employees with an insight into the emerging trends in the Canterbury IT market. 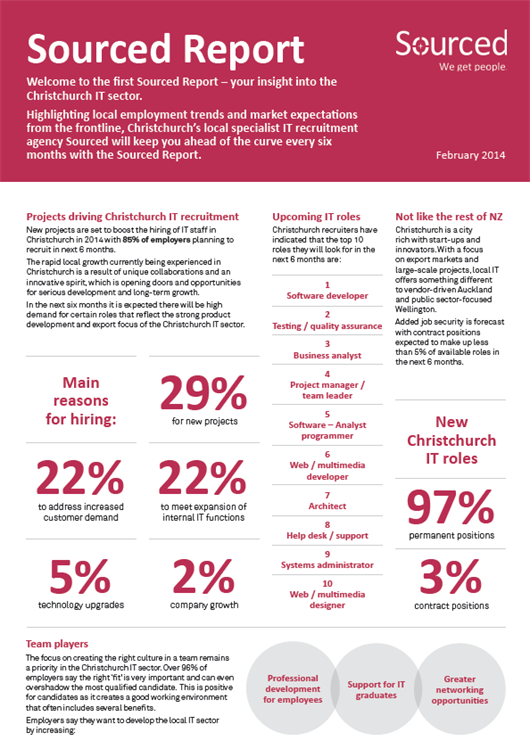 Welcome to the fifth Sourced Report – your insight into the Christchurch IT sector. 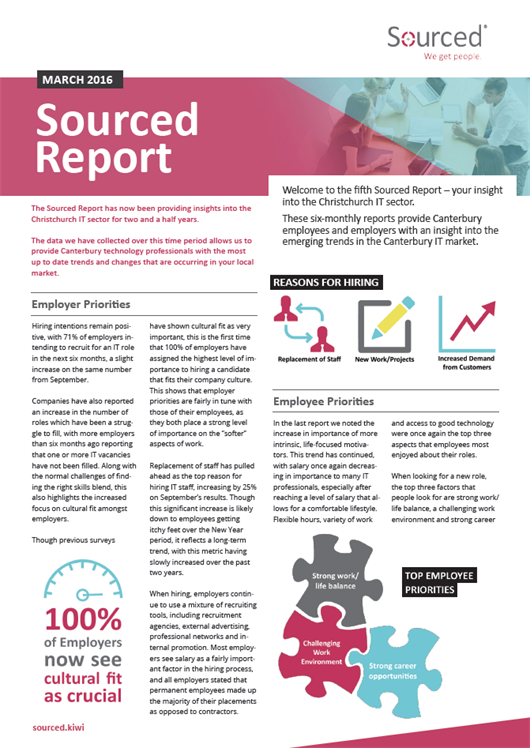 These six-monthly reports provide Canterbury employees and employers with an insight into the emerging trends in the Canterbury IT market. 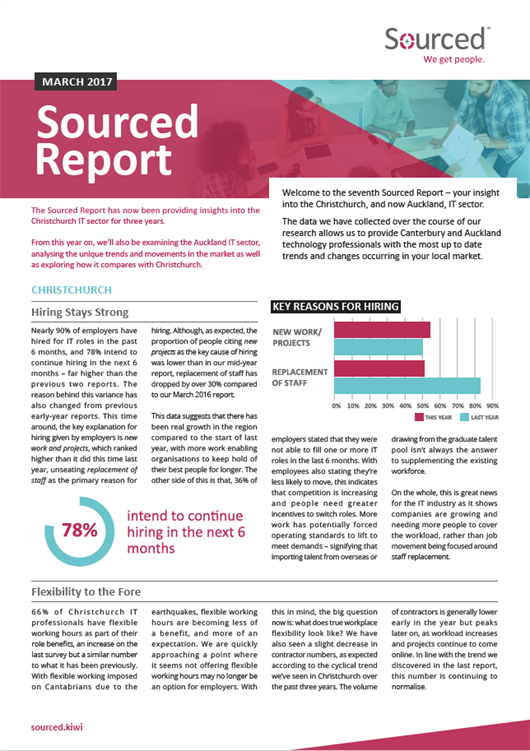 The Sourced Report has now been providing insights into the Christchurch IT sector for two and a half years.